At 10:45 a.m. on February 5, 1944, 1st Lt. John B. Beatty of Sandusky, OH, and 2d Lt. Earnest W. Fanslau of Mantua, NJ took to the air from the Ainsworth Army Air Field in two P-47 "Thunderbolt" fighter planes for an instrument training flight. Lt. Fanslau's canopy was covered so he could fly solely by instruments, while Lt. Beatty flew nearby as Fanslau's observer. During the flight Lt. Fanslau made an unexpected right turn that Lt. Beatty could not avoid. Rancher Everett Morris did not see the P-47s collide but he heard the impact and observed the planes falling from the sky southeast of his ranch buildings. Lt. Beatty's P-47 went into a flat spin, fell almost straight down, and landed on its back with very little scattering of the wreckage. Lt. Fanslau's P-47 caught fire and exploded in midair, spreading debris over a considerable area. Both pilots were killed. The two crash sites are within half a mile of each other in the Nebraska Sandhills, approximately 15 miles south of Wood Lake near Cherry County's eastern border. 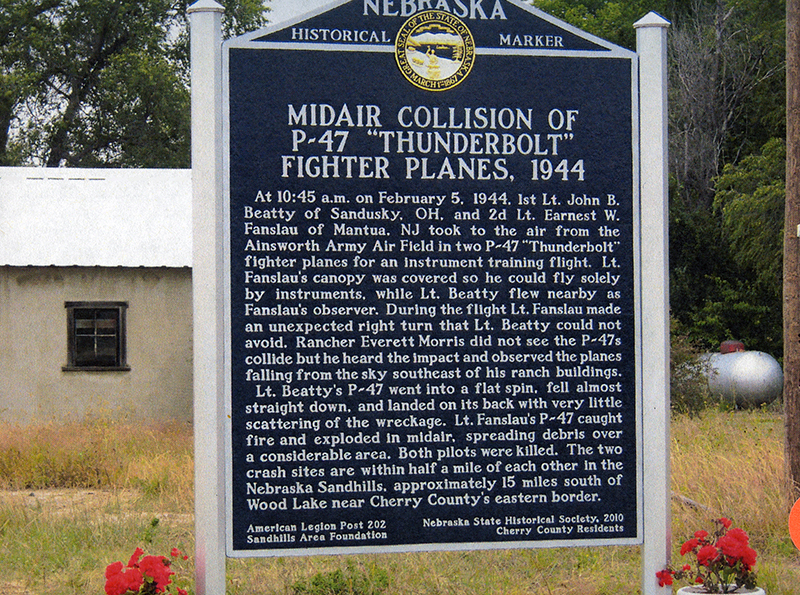 “Midair Collision of P-47 "Thunderbolt" Fighter Planes, 1944,” Explore Nebraska History, accessed April 18, 2019, https://mynehistory.com/items/show/68.